THE FOLLOWING REPORTS ARE AVAILABLE AT NO COST FOR OUR GEYSER AND VOLCANO MEMBERS ON OUR MEMBER PORTAL, AND AVAILABLE FOR PURCHASE FOR ANYONE ELSE. BECOME A CANGEA MEMBER TO GAIN ACCESS TO OUR MEMBER PORTAL, WHICH INCLUDES PROPRIETARY RESEARCH, REPORTS, AND POLICY DOCUMENTS. 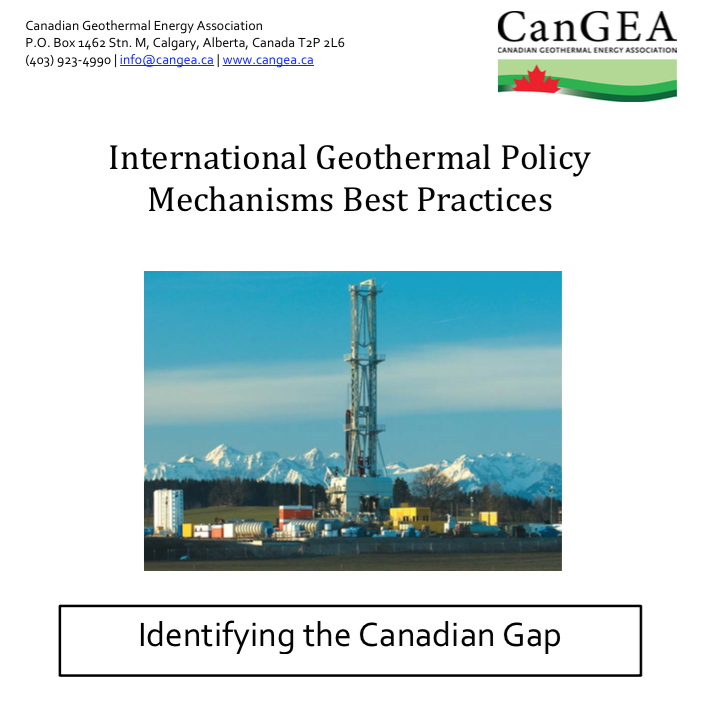 This publication gives an overview of Canadian geothermal policy, its gaps, and how to effectively address them. This report provides an overview of our members within the Canadian geothermal energy industry. It includes detailed information about Canadian companies in the geothermal supply chain and highlights their world-class skills, projects, goods and potential investment opportunities. CanGEA produced its first document on the direct use applications, or non-electric utilization, of geothermal heat. 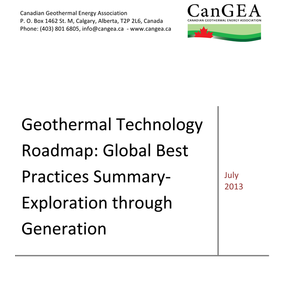 The purpose of the report is to bring tested, cutting edge, and internationally renowned direct use applications to Canada’s nascent geothermal industry. In 242 pages, the report covers a variety of possible applications including, but not limited to, greenhouses, aquaculture facilities, other food-related applications, district heating systems, pools and spas, and ice and snow melting. There are four sections that offer inspiration and primary instruction on designing and implementing a direct use project. 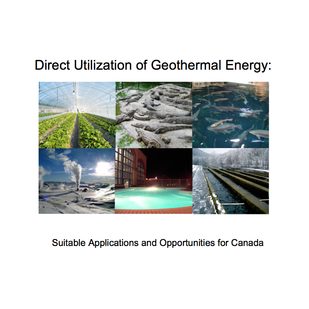 Part I provides an overview of possible direct use applications; Part II outlines project development and design guidelines; Part III displays geothermal resources in Canada; and Part IV discusses direct use applications and opportunities in a Canadian context. 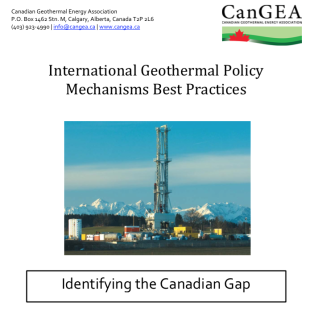 This long awaited for, 100+ page report identifies the Canadian geothermal policy gap for both conventional and unconventional geothermal resources. 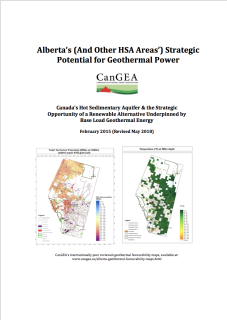 If you want to know how to spur geothermal development in Canada, this is the report for you! 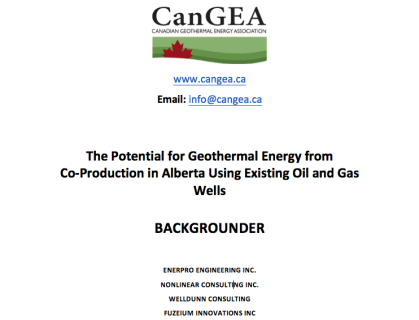 This 7-page Backgrounder provides a summary of the full report The Potential for Geothermal Energy From Co-Production in Alberta Using Existing Oil and Gas Wells. 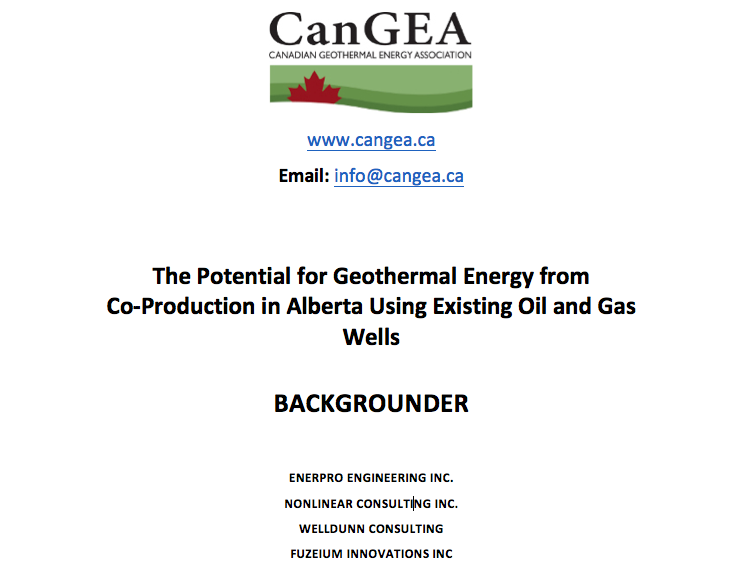 This includes a summary of the study that CanGEA conducted in partnership with Alberta Economic Development and Trade and CanGEA members Enerpro Engineering, WellDunn Consulting, Non-Linear Consulting, and Fuzeium Innovations. The backgrounder summarizes results from the study and its applications, but does not include any data sets. Readers will be able to view several maps that illustrate where wells of different temperature categories are clustered in Alberta. ​Providing background knowledge to the reader, the report starts with an introduction to geothermal energy and its possible applications. It details the different possibilities of power production from geothermal resources and identifies the most important direct use applications. 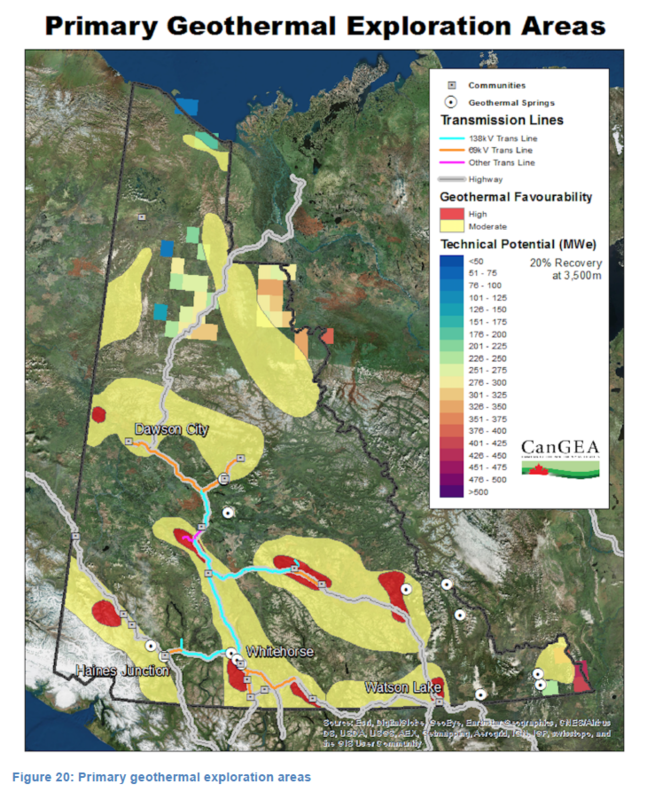 The second part of the report introduces the geothermal favourability maps of the Yukon. It provides qualitative and quantitative information about local temperature profiles, the geothermal gradient, estimated conductivity, estimated heat flow and the technical and theoretical potential. The favourability maps were also released separately and are available as part of the Canadian National Geothermal Database (CNGD). The geothermal potential of the Yukon implies more than 1,700 MW of indicated resources at a depth of less than 5,000 metres (using a 5% recovery factor). This number rises to approximately 5,000 MW when inferred resources are considered. Approximately 100 MW of low-hanging-fruit resources are available at a depth of less than 2,000 metres. After the discussion of specific communities, four case studies from Alaska, the Yukon and the Northwest Territories are portrayed in order to display the variability of geothermal projects in northern climates and their development. Ending with information on resource identification, resource rights, market factors, uncertainty, resource exploration, environmental impact, finances and public acceptance, the report explains why these factors are essential to geothermal project development. 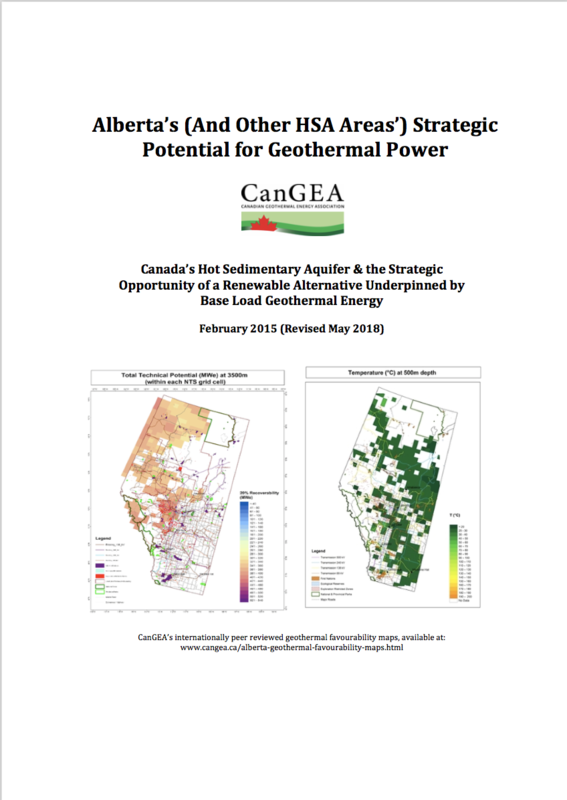 CanGEA Responds to the shortcomings in BC Geoscience & BC Hydro's recently released report: "An assessment of the Economic Viability of Selected Geothermal Resources in British Columbia." This 88-page report reviews what other leading nations and agencies have already published and thus informs our target audience, geothermal developers and investors, of the state-of-the-art technologies in the industry and enables them to consider applications to their own projects. For technology providers, this report will inform research and business plans by discovering what priority areas of research still remain unsolved and by identifying step-out applications for the markets they currently serve.  Further, Small and Medium Enterprises (SME's) are of special importance when considering the audience, as these organizations most often lack the internal resources to accumulate the type of information presented in this report in a comprehensive manner. This 25 page document is a compilation of historical data collected from Canada’s 157 known thermal springs. It includes valuable information including the approximate location, water chemistry, temperature, and volumetric flow readings of most thermal springs in Western Canada. CanGEA’s improvements to past work include verification of and updating all values that are publicly available. The CanGEA project also made use of the data in two geothermometers to estimate reservoir temperatures and heat flow. Thermal springs for which sufficient data is not currently available have also been identified with the expectation that future surveying and sampling may be conducted to fill knowledge gaps. 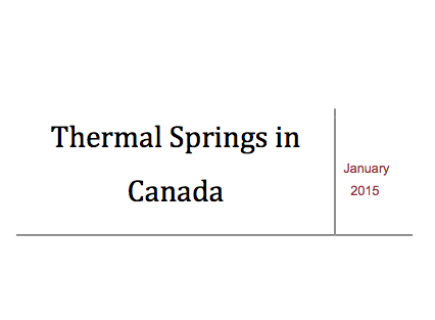 Meta data is also available in a spreadsheet format and is expected to be released later in 2015 (included in the cost of the Thermal Springs in Canada report). Of special interest to the Mining sector, this document includes single sample readings for silica, sodium, potassium, calcium, magnesium, lithium, chlorine, sulphate, and bicarbonates. A growing international trend is to harvest these valuable commodities via the co-production of geothermal power and heat.